With an eighty percent of rain showers expected during the two session window of final qualifying on Thursday, most of the 56 entrants set to do battle in the 2015 24 Hours of Le Mans figured that the late night opening qualifying session on Wednesday could be the one and only chance to post a fast enough time to secure a strong position on the starting grid. 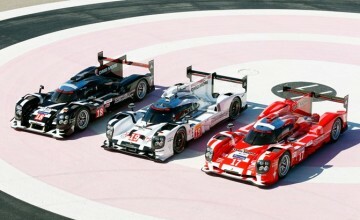 If that was the strategy plan for Team Porsche at Circuit de la Sarthe, it was certainly played out to a T.
With a performance that former head of Porsche Motorsport Norbert Singer would have been proud of, the Weissach, Germany based trio of 919 Hybrids steamrolled the competition on Wednesday evening, taking for now the top three positions on the provisional grid, including a pummeling of the previous track record on the current 8.45 mile track layout and a close shave toward capturing the all-time Le Mans lap record. dating back to pre-1990 when the two chicanes on the Mulsanne Straight did not exist, allowing cars to reach speeds nearing 250 miles per hour. Although the distance to create that kind of top speed today is not present, Neel Jani didn’t seem to mind as he took the team’s No. 18 entry around a full lap in just three minutes, 16.887 seconds, nearly two seconds faster than the previous best posted by Peugeot’s 908 diesel coupe in 2008. The Swiss-based Jani, who will share the entry with Mark Lieb and Romain Dumas, was just under nine tenths of a second clear of the pack, led by Porsche’s second entry the No. 17 of Brendan Hartley, Mark Webber, and Timo Bernhard. 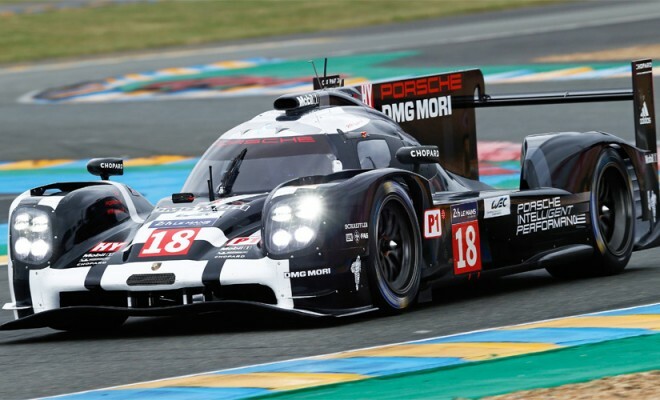 As expected, the team’s two full-time FIA World Endurance Championship runners led the assault, however the part-time third entry led by Formula One veteran Nico Hulkenberg was still in the ballpark. The No. 19, which also features former Porsche factory GT drivers Nick Tandy and Earl Bamber was in the 3:19 bracket on Wednesday. Even though Porsche dominated the first session of qualifying, fellow German marque Audi Sport Team Joest is not far behind with its own trio of Audi R18 E-Tron Quattro coupes. The No. 8 entry of Loic Duval, Oliver Jarvis, and Lucas Di Grassi were second in the pre-qualifying warm-up session, but were unable to make the same time gains as Porsche did and is currently fourth on the grid, with its two sister cars in fifth and sixth. 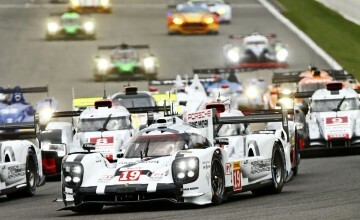 After taking the pole position in last year’s event, Toyota Gazoo Racing continued to struggle for pace on Wednesday, and is currently filling out the fourth row with its two-car assault.Despite gaining two full seconds from the official test day fast lap they fired off, a 3:23 and change was still well off the pace of Neel Jani. Nissan also continued its exploratory effort in the LMP-1 hybrid category, and was 12th overall on the list after one session with its top entry. For ORECA head man Hugues de Chaunac, it does not hurt that his factory operation is based not too far from the Le Mans circuit. Even though 2015 finds his operation without a factory team on the grid, his group’s work as a constructor in the LMP-2 division is paying huge dividends this week, as Hong Kong’s KC Motorsports Group (KCMG) placed de Chaunac’s newest challenger; the ORECA 05 coupe on provisional class pole Wednesday with a 3:38.032 pass. KCMG had hoped to have two entries on the grid at Le Mans in 2015, however despite running two entries during the test day, a second spot in the 56-car lineup was not available to them, despite holding preference as the first alternate. ORECA is a rabbit in LMP-2, as are the pair of Gibson 015S open top spyder chassis behind them. Greaves Motorsport and Jota Sport each have a victory in the baby prototype division at Le Mans already under their belt and after one session of qualifying are in a solid striking position, in positions two and three in class. Both runners were nine tenths off the KCMG entry. FIA WEC LMP-2 winners at Silverstone, England G-Drive Racing are also within range of the front with their Ligier JS P2-Nissan coupe in fourth, while the other ORECA 05 coupe, belonging to Thiriet by TDS Racing rounded out the first five. As has become the norm at Circuit de la Sarthe in recent years, the grand touring classifications in qualifying trim have been dominated by the Aston Martin Racing group and Wednesday night was no different. Richie Stanaway did the deed in the Pro category with a 3:54.928 in his Vantage V8, while as expected in the lower Amateur division, Pedro Lamy took the provisional top lap at 3:55.102. Although there are several AMR-backed entries close to the front in both groups, there are rival branded contenders within shouting distance, assuming the rain stays away to allow for meaningful running on Thursday. AF Corse placed a Ferrari 458 Italia in the second position in both divisions on Wednesday with Giancarlo Fisichella and Emmanuel Collard respectively posting the fast laps in the session. While AMR did manage to take three of the top four spots in the GTE-Pro session, the rest of the pack outside of just AF Corse is close behind. TUDOR United SportsCar Championship regulars Corvette Racing placed its two-car squad in positions five and six after session one, with the lead car of Jan Magnussen just one second off the pole time. In Amateur, the surprise of Wednesday came via the impressive pace of Proton Competition’s Porsche 911 RSRs, with the team’s Abu Dhabi-backed entry claiming the number four spot, and the Patrick Dempsey driven entry qualifying sixth. Outside of Corvette and Dempsey however, the American-based runners struggled for pace on Wednesday. Of the three Stars and Stripes based runners in the 19-car LMP-2 field, the best of the bunch was the lead ESM Racing Ligier-Honda coupe, which was mired back in 15th place after session one. A mid-pack scenario is also present for TUSCC regulars Scuderia Corsa and Riley Motorsports in GTE-Amateur. The Townsend Bell and Bill Sweedler driven SC Ferrari is currently lined up in seventh in the division, while the return of the Riley Dodge Viper netted an eighth fastest effort in the class, despite the best efforts from Jeroen Bleekemolen. Rain or shine, two sessions of qualifying are set for Thursday, the last chance for teams to prepare for the start of the 24 Hours of Le Mans on Saturday afternoon.